Ancient heritage sites have been preserved and paid attention to for not just religious, but also political and geographical reasons. The Changu Narayan is one such monument. The gwala (cowherd) walked along the forest with his newly acquired cow. Sudarshan, the Brahmin who had sold it to him, had promised that the cow was capable of producing large quantities of milk. The gwala was pleased. After walking for some time, he stopped in a dense spot to let the cow graze. The cow went behind one particular tree and came back, continuing to graze. As days went by the boy would keep taking the cow and the cow would go behind the same tree every day. The boy noticed that the cow had not been producing any substantial amount of milk, so he called old Sudarshan to come with him one day to watch the cow. A surprised Sudarshan came and also observed that the cow was in fact producing far less milk than before. They both went behind the tree to find a little boy drinking milk off the cow. In their fury, Sudarshan and the Gwala thought that the dark boy must be some kind of a demon, whose home was in that tree. Procuring an axe, they struck the tree down, which proceeded to bleed. Lord Vishnu emerged from the tree and proclaimed that the gwala and Sudarshan had liberated Vishnu from a great sin that he had committed once upon a time. By felling the tree, they had felled Vishnu’s curse. Overjoyed and awestruck, Sudarshan and the gwala established a shrine where the tree was. That shrine is now the shrine resting in the magnificent Changu Narayan Temple. Now, this is the folklore that resonates throughout the people living near the temple and within the walls of the Changu museum, where it has been documented. The original folklore was also perhaps an early prompt that lead to the temple and the shrine gaining so much religious importance. This religious relevance ensured that the temple kept being renovated, rebuilt and maintained throughout its long and eventful 1700-year history. 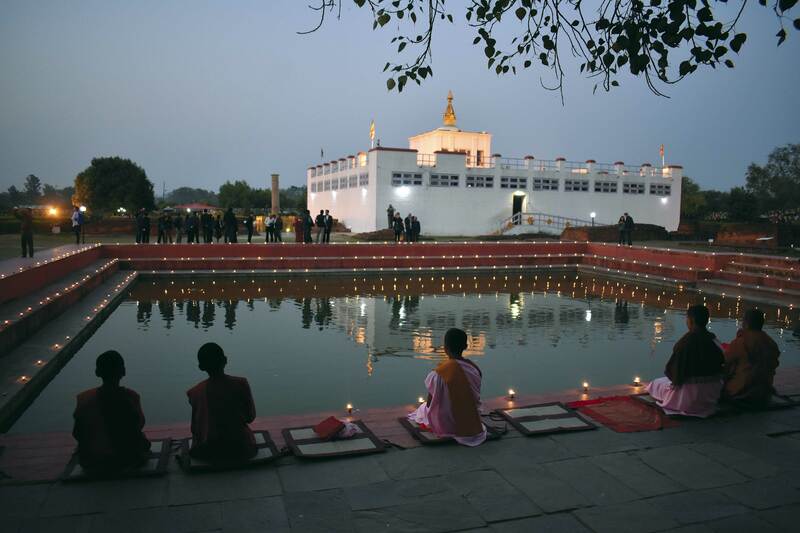 Various sources cite a number of different times it has been completely restored, by Visva Malla between 1548 and 1560, then by Queen Ganga Rani between 1585 and 1614, then again in 1694 by Queen Radhelakshmi. Many other kings and queens have carried out partial restorations. Having been destroyed and built four times over without affecting the grasp on religious sentiments of Kathmandu dwellers, the Changu Narayan temple as it stands today, is a testament to our intangible cultural heritage and its triumph over and independence from just the tangible structure. But of course, one would be naive in thinking that the intangible heritage that has kept the temple alive only consists of religion, folklore and faith. Intertwined with these aspects of Changu is its geographical uniqueness and the history of politics surrounding the temple. The complex of the religious, geographical and political histories is what creates this sense of cultural heritage that has lead to so many rulers over the centuries having invested in completely rebuilding it four times and renovating parts of it countless times. Changu and its surrounding areas have had rich history of political intrigue, largely due to its geography. It was first established by Haridatta Verma as early as 325 AD, who also established the three other Narayans around the city: Bishankhu, Shesh and Ichangu. Yes, this can be seen as an act of devotion and an attempt to please the gods, but one notices that all four of these temples mark the boundaries of the Kathmandu Valley. Historians like Purshottam Shrestha points out that while being built for religious reasons, this temple along with the other three were also veiled statements of power by the king who was declaring his territory. The next big renovation done there was by Man Dev sometime between 497 and 524 A.D. He erected a pillar to commemorate the renovation, but more importantly to document his military suppression of the Malla kings of Gandaki and the Kirants approaching from Koshi. It then became a major strategic point during Malla era. Jagat Prakash Malla (1644-1673) , the king of Bhaktapur, had made Changu a stronghold. As it was high up on a hilltop, it was on a good vantage point and was difficult to access compared to a fort on plain land. When it was temporarily captured by Pratap Malla of Kathmandu, he recaptured it and sacrificed Pratap Malla’s soldiers in the Chinnamasta Temple next to the main pagoda. Many historians believe that humans were sacrificed in the temple, and here lies an example of how religion blended with bloody politics. Taking on the color of religious belief and customs is important political power play that has characterized feudal Nepal for the last few millennia. The point that we should realize is that this mixture of politics and religion is a part of our intangible cultural heritage if we think of heritage in its widest sense: as something we carry on from the past. The temple has been rebuilt so many times and given so much importance not just because it is a deeply spiritual place that is extremely important to Hindus, but also because it has been such an important strategic point for various rulers throughout history who wished to preserve it as one. This is not to say, however, that faith has not been the driving force behind the powerful intangible culture built on the temple. Many will still believe the folklore told earlier as the only true origin story of the temple. Haridutta Verma is known to have been a devout Vaishnav who brought Vaishnavism at par with Shaivism in Nepal. Most worshippers throughout the ages have believed in the shrine’s power and many rulers have carried out restorations out of pure devotion. In fact, to this day, a strong living culture continues to thrive in the Changu area. During events like Teej and Haribodhini Ekadashi and during each Shukla Ekadashi, huge celebrations are held in the temple. Chariot proceedings (Rath Yatras) take place during Changu Narayan Day (around March), Krishna Janmashtami and even Holi. The locals claim that the number of visitors has been rising over the past few years, out of which more and more Nepalis have been coming to pray (as opposed to coming for recreation). And then, of course, there is also the stunning art and architecture of the temple. One still feels awed when one enters the temple from the opening side in the west. The gold plated doors with intricate carvings, the huge lions guarding the temple that are significantly bigger than other such lions seen in the Durbar Square, the immense figures sculpted on the struts of the temple, and just the sheer size of it, put the temple on a higher plinth (although not literally) than most other pagodas in Nepal. There has been debate over how similar each reconstruction was to the previous one. The general opinion is that the temple architecture has strictly remained the same, given that the architecture has strong tantric elements to it and follows vastu-shastra, our ancient code of building. However, historians like N.K Bannerjee have suggested that at least during the Lichchavi times, it was originally built in the Shikhar style, or at least in a hybrid system of Shikhar and Pagoda. The point, however, is that the living heritage around it has been lenient on the architecture and structure. The focus of the community is the shrine and one’s devotion to the God, as opposed to an aesthetic appreciation of the temple. It is historians and conservationists who concern themselves with the temple’s physical evolution throughout the ages, which is very important in its own right, but does not dictate why the temple continues to be so relevant and so timeless for the community. All this being said, Changu Narayan faces a threat. Restorations and renovations are costly affairs, and the reason why Changu has so conveniently gotten both is, as mentioned, the conglomeration of its religious, political and artistic relevance. Nepal no longer remains a feudal nation and Changu no longer remains a ground for politics and strategy. It continues to be important as a heritage site for academics and researchers and for religious purposes, but the state does not have as important a reason as before to preserve it. Added to this is the possibility that the secular state will not religiously pursue its preservation. This is admittedly an irrational fear. After all, India is a secular state and India’s sites of religious importance have gained considerable backing from the government. But the emphasis is that even in this progressive age, without a religious sense of duty and a higher calling to invest in the temple’s restoration, heritage preservation becomes but another administrative affair, subject to red tape and bureaucracy as is the case with most of the other government affairs. And this is a current danger too. There is no accountability as to how the temple is being restored from the 2015 earthquake, whether the reinserted bricks make the structure stable or whether they are yet another make-do effort by the Department of Archeology. There is only so much the local community can do. Of course, the community has been as active as ever, perhaps even more. Attendance at the aforementioned festivals and celebrations has gone up over the past few years and Changu had become increasingly popular. Expectedly, after the earthquake there has been a halt to the number of visitors, but since the priests reopened the temple on the 17th of July, the number of visitors is rising. Again, one may find solace in the fact that the temple has a strong enough sense of intangible heritage for it to be given enough attention by international organizations like UNESCO. It is, after all, a world heritage site and renovation efforts have been regular. The essence is the fact that our intangible heritage comprises of much more than folklore and faith. It is a complex of the way we have looked and lived in the world around us for the past hundreds of years, and it is this that gives life to any temple in the Kathmandu Valley. Intangible heritage is unaffected by the physical destruction of temples due to the earthquake and if Nepal progresses as it has, there is little to suggest that Changu Narayan will fall to neglect permanently.